Bird Brains: A model for Expanding the Human Mind in College? Shoshana works in the laboratory of Dr. Carolyn Pytte who comes out of the bird song neuroscience tradition. Shoshana and I agreed to write this blog with two intertwined themes: Neuroscience of brain plasticity and her own experiences being an undergraduate research assistant. I find both stories to be encouraging of the idea that we can build the student’s capacity in college education as well as teach important facts and theories that will be useful to a career. So, to start us off, Shoshana, can you explain in simple terms what it is happening when we say new neurons are born in the brain of adult birds and find a useful place in the brain circuit that underlies the production of bird song? The first paper in the field was by Goldman & Nottebohm (1983), but my lab PI, Carolyn, often likes to quote an article by Bailey & Kandel (1993), who maintain that one of the key principles of behavioral neuroscience is that experience can modify brain structure long after brain development is complete. One of the most dramatic changes in the postnatal-brain is neurogenesis, where entirely new neurons are made in the brain of an adult. This phenomenon is seen across the animal kingdom, not just in birds. For example, animals that learn new odors have increases in new neurons in their olfactory bulbs. Similarly, increased neurogenesis in a memory related brain area, the hippocampus, has been shown to occur during spatial learning in rodents. 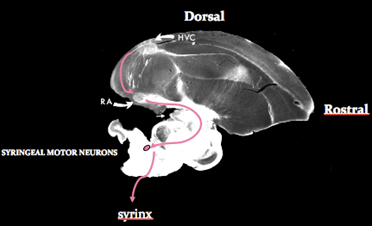 Our lab uses the zebra finch songbird to study the relationship between song learning and the brain and, I specifically to look at the song motor pathway (in pink, below). Here, new neurons project from nucleus a brain area called the HVC to nucleus RA, which contains the motor commands for singing. RA projects to the motor neurons that innervate the muscles of the syrinx, the vocal organ in birds. Within HVC, new neurons are incorporated throughout a bird’s life. For more detail see a 2005 article by Nottebohm. That is very cool. Who would have thought birds would have so much to teach us about brain plasticity? But it was here that the phenomenon of new neurons in adult brains was discovered. Now, please talk about another part of the lab’s work where you related song performance to the survival of these new neurons in HVC. First, I have to point out that even though neurons are continually replaced in HVC, the songs of the bird that are the direct output of this motor pathway are stable. This is amazing in itself as the song itself is highly stereotyped and probably has to be to be useful to attract mates. An analogy can be made to human speech, which is also very stereotyped and stable and has to be to communicate well within the language spoken. Like children who learn a first language without training, zebra finches learn the song of their social group when they are little. They start to sing it in maturity and then auditory feedback from their own singing in comparison to what they have previously learned teaches them to perform well own song. The new neurons that are continuously incorporated into HVC somehow must be “taught” to fit in to the ongoing song. That is presumed to happen through auditory feedback because making it impossible for the birds to hear their own song leads to more individual variability in song performance and that may be a result of these new neurons “messing up” the existing song motor program without the correcting feedback. What is particularly interesting, and what you mention it above, is a recent result in our lab. We found that if one interferes with song production by treating the vocal apparatus with the drug Botox in otherwise normal birds, these new neurons in the HVC area of the brain do not survive. They die by a process neuroscientists call apoptosis, which also happens in development when more neurons than needed for a brain circuit are produced and the extra ones are “pruned” away. It is almost as if the new neurons somehow knew they were not contributing to the song and died. Of course, I do not mean that individual neurons think…they are just cells. But somehow their survival seems to depend on how well the brain circuit does in performing. Of course, there are other ways in which the nervous system can change in adults following experience, including the classical formation of new synapses to change the connections between neurons and a recent discovery that the myelin insulation around neurons may change with firing to affect timing of signal conduction to other neurons. But let’s switch topics a bit and ask about what might be the result of changes in your brain. You joined this lab some time ago and now you have certain skills you can do that I hear you teach other younger undergraduates. How does it feel to have achieved this mastery in the lab? Do you ever wonder if new neurons in your brain are finding a home in some area because you are learning new skills? Coming into the lab my Freshman year, I was incredibly intimidated by the amount of tasks and level of skill necessary to complete the various experiments. I remember observing my upperclassmen and graduate student colleagues with awe, wondering if I would be able to perform lab tasks with the same degree of expertise. Sure enough, over the years I have been able to fine-tune my own skills in the lab to the point where many of my undertakings have become second nature. What I find particularly interesting is the similarity of my mastery of lab techniques with the stereotyped proficiency of a zebra finch’s vocalizations. Just as I have been able to learn lab protocols and methodologies from my mentor Carolyn, so too, the juvenile songbird is able to absorb the song of his tutor (who we even refer to as the “mentor”). 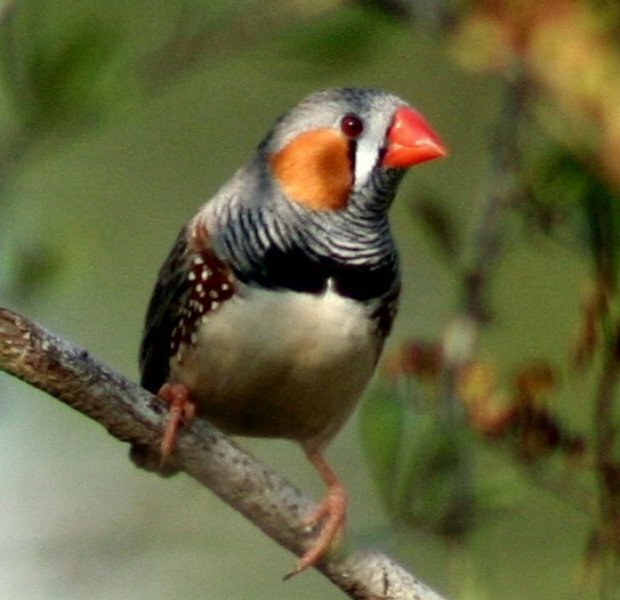 From research, we know that neurogenesis plays a large role in the learning of the zebra finch song. Therefore, I think it makes sense to wonder if my own learned motor behaviors have someone caused a rewiring in my brain. When I think back to my early undergraduate experience and compare it to the way I am now, I can’t help but conclude that neuronal plasticity has allowed for the modification of my behavior. This last statement says it all. There are a number of books and other findings we will continue to review in this blog, but that last statement that you could come so far, and so could many of us, by happily learning from experience is the point. And it is just too cool that the word “mentor” is used in your song bird research and again by you to refer to this important aspect of your experience as a student. In an era where people say education is broken, this is education that works.